We exclusively cloth-diapered Kathrynne and loved it… plus, we saved so much money. In fact, I don’t know how we would have ever afforded to buy disposable diapers since there were many weeks in those days when we struggled to just pay for our food and rent. Get Creative — Willing to think outside the box a little? Check out these two articles: How to Cloth Diaper for Practically Free and Start Cloth Diapering at Home for $20 (no sewing required). BabyWorks has some interesting statistics and stories on how much you can save by cloth diapering. You can also read some of my readers’ answers to this question. And here’s a breakdown of a number of different diaper costs from Diaper Decisions. Oh, and using cloth diapers helps in hastening potty training. Another plus! 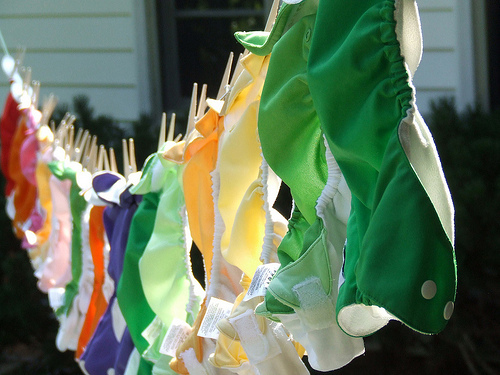 We’ve been cloth-diapering since I gave birth to my oldest daughter 3 1/2 years ago! Now we have 3 children, and we’ve cloth-diapered all of them with Bum Genius. For our newborn, we decided to mail our velcro diapers to http://www.convertmydiapers.com, and had them all converted to snap diapers. For my initial research, I asked my friends on Facebook for feedback and that’s how we decided on Bum Genius. We’ve bought all of ours new on Ebay because the prices were lower there. 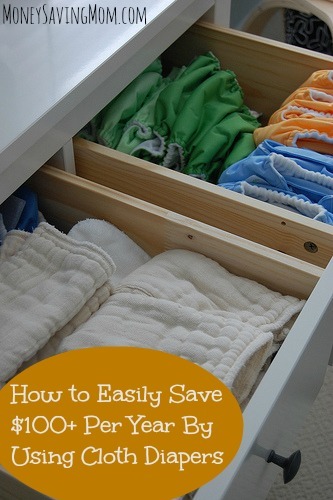 I know we’ve saved a lot of money cloth-diapering, and we also save by hang-drying all of our laundry during the warmer months (which are most months here in California). Thanks for all the good suggestions for saving money! But my daughter who just turned 2 we haven’t bought diapers for her since I was pregnant. We got such a deal at Walgreens we stocked up on every size!!! Now we did not clear shelves. We went to several Walgreens over a course of time and many different days. We hit a sale on their brand, plus coupons and ending up paying $2 a package!!! We also hit Babies R Us on black Friday for their diapers for $10, normally $22.50. We did the same thing for wipes and haven’t bought those either. 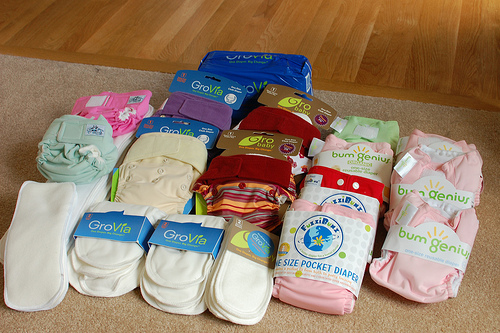 Ultimately, our plan will be to use disposables from the get-go, and then order the trial set from Jillian’s Drawers (http://www.jilliansdrawers.com/products/clothdiapers/tryclothfor10/tryclothfor10) to see which ones will work for him. We’ll keep a supply of disposables on hand for church and the like (most of our nursery workers are young like me, and I don’t want to throw them off with cloth) and use cloth exclusively around the house. Since we plan on having more kids eventually, it will be a good investment for us. Our apartment complex doesn’t charge us for water, so no worries there. I worry about line drying in humid South Florida air, though. Afraid they’ll mildew. Especially since Josh will be a July baby. Anyone considering cloth diapers don’t be afraid. It’s can seem overwhelming but I found it helpful to read what others did. We did it a little differently the second time as there are better diapers that weren’t around with my son. We still use those from my son too. Check out http://diaperpin.com for tips, reviews and a forum to see what “systems” other moms use. And if you’re interested in good deals, http://www.diaperswappers.com is the place to start. I cloth diaper my 16 month old full time along with my 3.5 year old at night and my 5.5 year old who wets the bed. I started doing cloth to save money but also love that I am reducing the amount of chemicals my children are in contact with. I’m with you Elizabeth! Cloth diapers just gross me out plus with having to pay for water and not really having the line drying option (we live in the city and do have a small clothesline but I keep it occupied just with my regular laundry so I don’t know WHEN I’d ever have time to get cloth diapers dried on it too) I wasn’t convinced it would save us enough to warrant the headache. I’ve been able to get disposables for $5 or less using coupons and for us, even if we spend a bit more, it’s been worth it. Before my daughter was born almost two years ago I honestly didn’t consider cloth diapers. I had used them when I used to babysit in high school and remember the diaper pins and rubber pants and rinsing the dirty ones out in the bathtub (yep, that’s what this family did!) and I just couldn’t stomach doing that all day every day for 2+ years. So, I took total advantage of the great deals you used to be able to get on Amazon with the 30% Amazon Mom/Subscribe and Save, plus two 20% off coupons to get boxes of 250+ diapers for around $12. I figure I diapered my daughter for the first year for less than $100. So when people said they spent $500 on their stash of cloth diapers and yet insisted they were saving money over disposables it just didn’t add up for me. Then Amazon stopped issuing those coupons, and reduced their Amazon Mom savings to 20%, and we got a new washing machine (didn’t really trust the old one to get cloth diapers clean since it didn’t do a good job just getting our clothes clean!) so I started to look into cloth. I started with one Flip cover and three inserts that I got off of Ebay. 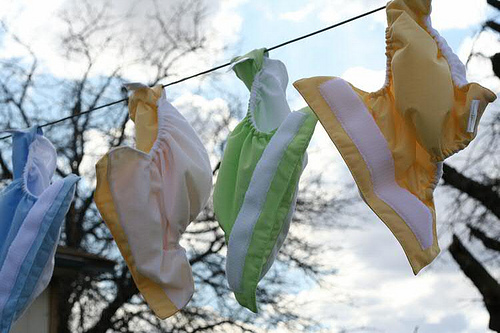 I found out that cloth diapering now is so much different than it used to be! I’ve now exapended my stash a bit, but still only have three covers and 12 inserts. Everything I’ve read says that you should wash cloth diapers every two days anyhow, so that gets me through two days and I wash at night after my daughter is in bed. I don’t exclusively use cloth – still use disposable at night, when we’re out-and-about, and when we travel – but that’s what works for our family. Now that I can’t get disposables for 5-8 cents each like I used to, I do believe that cloth saves us money. I have to tell you about a homeschool gal (10-year-old) that has started a business selling diapers. Her website is http://www.liliesdiapers.com/ and we think they are great. I cloth diapered 5 of my 6 children in the day of rubber pants. We got creative with extra linings and I loved it when they came out with the overnight inserts. We did it out of frugality. I couldn’t see spending all that money on disposable diapers. It was work outside the home and buy them or get the privilege of staying home and use cloth. What a choice! My daughter says I was the “crunchy mama” before they became popular. She now has left her out of home career and taken the plunge to stay at home with her son, her life long dream. She has an on-line cloth diapering business, FiggyFuzz Baby Boutique at http://www.figgyfuzz.com. I invite you to go and take a look.